The Black Flowers page (When Black Roses Bloom) is updated to include the ‘Winter Dreams Black’ hellebore that I got last year. It’s a gorgeous flower. I clipped last year’s foliage off – it helps protect the plant over winter, but by spring it looks pretty tatty and obscures the view of the flowers. 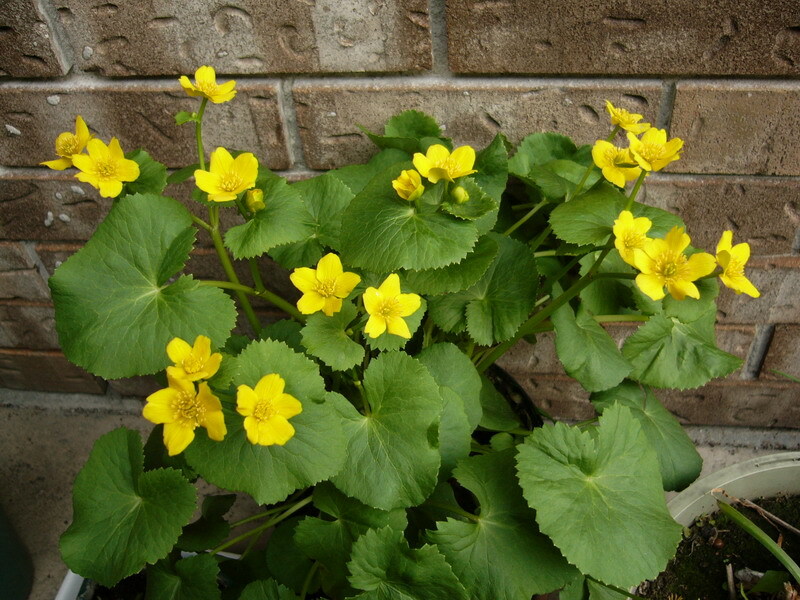 The marsh marigold (Caltha palustris) also finally flowered this year. I’ve been waiting two years for this; this is the third season I’ve had it. I thought it would flower last year, but the one little spray of buds never opened. It’s really making up for lost time now, though. It’s in a 1-gallon pot, and in the picture it was on the patio, but I’ve since moved it to a tub of water along with the dwarf papyrus (Cyperus isocladus). The weather’s still a little iffy to be placing the papyrus out, but it should be fine. The bloodroot (Sanguinaria canadensis) has been and is nearly gone, the moss phlox (Phlox subulata ‘Emerald Blue’) is gearing up to enter full bloom, and the tulips are just starting to open. I bought another Venus’ flytrap (Dionaea muscipula) on impulse at a garden centre a couple days ago, mostly because they looked quite healthy (they usually look pretty sad when you see them in most garden centres). The not-so-black calla lilies (Zantedeschia ‘Schwartzwalder’) are already blooming. I kept them in their pots in the basement over winter and they started sprouting back in March, so they’re well ahead. Someone gave me some ‘Black Star’ callas as a gift and I just planted them, so I hope these turn out better colourwise. The ‘Karma Choc’ dahlia is well away and the three cuttings I took a month ago are still alive. I guess that’s about all that’s going on for now. The onions and peas have sprouted and the artichokes are about ready for planting out. The herbs (Greek oregano, a couple types of thyme, orange mint, valerian, wintergreen, orris root, pineapple sage) I got two weeks ago are all hardened off now, so it will be time to plant them out soon too. Tomorrow I head to the NANPS native plant sale. I feel so swamped in the garden right now. I’ve spent most of this week sawing and drilling to make all the bits for the trellis/pergola I need to put up to support the hops (Humulus lupulus) and other vines, and the post holes still need to be dug and prepared, the vegetable plots need to be dug over, and today the two dozen strawberry plants and the grape vine I ordered came in the mail. Bare root. The strawberry plot suddenly became the first priority…then that got held back because I hit an almighty stone that needed to be taken out, so by the time it got dark I’d only planted two thirds. The grape probably won’t get planted until well into next week, so into a pot it went instead, for now. And ironically, regarding the title of this post, the last two weeks have been pretty dry for April. Still, it’s lovely outside now, and everything is leafing out. The bloodroots (Sanguinaria canadensis) are in full bloom and most of the roses survived. Okay, I’m convinced it’s spring now. I had a furtle around in the garden and poked through the winter mulch (basically just fallen leaves) and some things are showing through at last. In the herb bed, it’s just the chives (Allium schoenoprasum), garlic chives (A. tuberosum), and garlic (A. sativum) right now, which is pretty much what you’d expect. Alliums are pretty cold hardy and are always among the first things to show up in the herb garden. As for the flowers, liverwort (Anemone hepatica var. acuta, formerly Hepatica acutiloba), bottle gentian (Gentiana andrewsii), and bee balm (Monarda didyma) are showing up. Oddly, the bloodroot (Sanguinaria canadensis) isn’t showing at all, and I’d expect that around now too…maybe I’m overfussing, because it is one of my favourite flowers. The astilbes (Astilbe spp.) I’ve been keeping for my Master Gardener group (in the garage) have also sprouted, so those came out today, along with some baby trees. Tomorrow evening is the monthly meeting of said Master Gardeners, so I probably won’t get a chance to do much more mucking around until Friday. Although I uncovered the roses several days ago, I didn’t unmound them. They all look pretty hard hit, so a good pruning will probably be in order. Today’s weather: 10C and sunny.